Every month, Oak Ridge National Laboratory’s (ORNL) supercomputer generates almost 1 PB of archive data, which must be managed and stored for easy and efficient file recall for its 1,200 users worldwide. So, to account for continued data growth, the laboratory needed a new archiving approach that provided exceptional data redundancy—without doubling costs—and data integrity for its community. 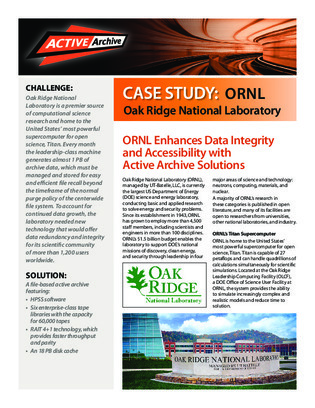 To learn more about the active archive solution, which incorporates RAIT technology, that ORNL implemented to meet these challenges, check out the full case study here.